When I roll out to go set up to sell at local venues, all of my products and display items must be easy to transport via city bus on this folding dolly. The red bag is part of a two-piece soft-side luggage set, made to slip over the handle of the suitcase, so it slides onto the dolly handle for a secure fit with no bungee cords required. 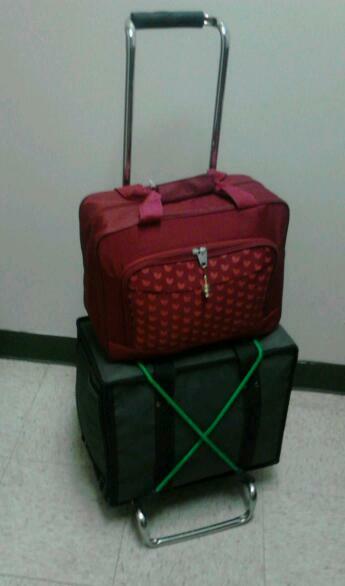 The boxy case under the red bag is a jeweler’s case that my father found for me at a yard sale last summer. It holds stacking trays. They were filled with old flocked plastic inserts that did not suit my needs, so I lined all the trays with scrapbook paper and divided some trays into sections with glued on strips of oak thin wood that I had on hand. The trays make for an easy set up… just cover the table, remove trays from case and arrange on top, add a few other things and done. That is, IF the items in the trays remained nice and neatly arranged during transportation. 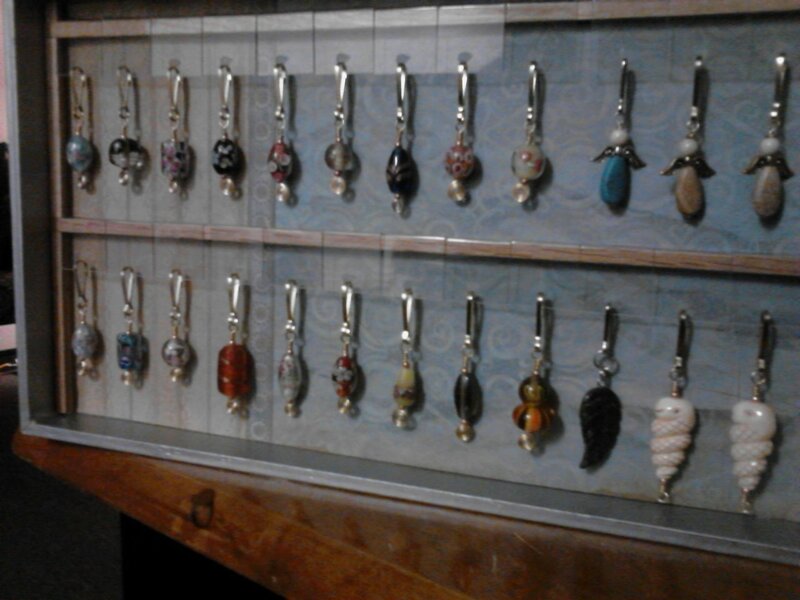 Last night, I solved a problem with displaying earrings and zipper charms. I priced rotating racks, wondered how I would transport a rack, and then came up with a solution on how to display items on hang cards using some of the trays that fit in my case. First, I glued “rails” across the narrow ends inside the tray so the oak thin wood bars for the hang cards could be slightly elevated off the bottom of the tray. Then, after deciding how far apart to place the bars, I cut oak thin wood to cover the exposed rails and help keep the bars where they belong. The oak was already sanded and varnished, so all I had to do was cut pieces to size and glue everything in place. So far, I have made three tray racks, each with bars spaced at different distances for earrings of different lengths. The rack in the photo (shown stood up, snapped by cell phone) was perfect for zipper charms. I think it makes for a nicer display that will transport well, perhaps with bubble-wrap folded on top to protect them. And, by using items I had on hand, it did not cost me a dime. Now all I need is to line up some local venues to go to… if anyone knows of any upcoming craft shows or anything in the Youngstown area (preferably on a WRTA bus route or within reasonable cab fare distance) please let me know! Thank you!